At the end of the Great War in November, 1918, Jim Langdon, of Langdon Plantation in Macon, Georgia, is preparing to continue his late father’s work for the full legal equality of Black Americans. Although slavery had been abolished fifty-two years earlier, constitutional rights and guaranteed protection under the law holds no meaning for black citizens. With his wife, Elizabeth, by his side and Almighty God leading the way, Jim immerses himself in the civil rights movement with a dream of showing the nation that black or white, we are all brothers and sisters. A long road with the possibility of so much to gain in the end is still a long road, especially when racism and hatred are waiting at every turn. 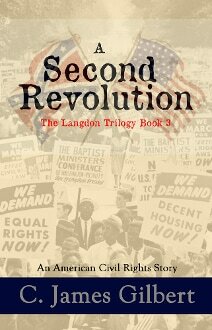 As bloodshed stains the pages of what was written yesterday and the lynching of innocent humans goes unpunished, the Langdons stand fast in their quest to influence people, politics, and patriots to believe that, “All men are created equal”, cannot be defined as a discriminatory phrase. As time goes by and generations of this Georgia family pass, the promise to carry on the fight passes also, with the hope that full legal equality is realized at the end of a second revolution.